When the bass I used during my time with the Attractions was stolen some years ago, I looked far and wide for a suitable replacement. 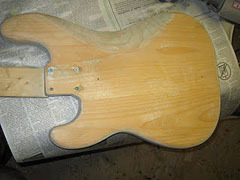 But as I’d customized that instrument quite a bit, eventually I decided that rather than adapting another vintage bass, I’d build one from scratch. When I mentioned this to my friend Barry Moorhouse at the Bass Centre in London, he reckoned there’d be other people who’d like one as well — he suggested we collaborate on producing a signature-model bass. Barry started looking for the best manufacturer he could find, while I set about recreating the right body shape and doing test paint mixes in various shades of ‘faded red’. But the most important thing was getting the neck profile right (hence the name) to give maximum ‘playability’. After a bit of experimenting on my part and many meetings with Barry, we had samples built in factories across Europe and the Far East — we worked on everything from entry-level basses to the elite bespoke instruments. One day we were sent a bass that stood out a mile from anything else we’d seen or played. Although getting the right bass was our only consideration, it turned out that this one was also one of the most affordable. Anyone who’s watched the development of the Profile Bass over the past couple of years will know that it’s not a stock bass I’ve simply added my name to — but a genuine personally-developed signature guitar. Our intention was not to produce a replica model or a phoney vintage guitar, but to create a new instrument true to the spirit of the original — a bass that’s a joy to play. I’m happy to say that’s now been achieved. As I no longer had my old modified 1964 P-bass for reference I used Barry’s own 1964 version to compare and contrast as we went along. We’ve also been lucky enough to hit on that chameleon blend of pink, orange and red that I call ‘Salmon Pink’. It’s an amazing, almost-living colour when it’s got right like this — it never seems to look the same twice and looks slightly different in every kind of light. After ‘distressing’ earlier versions of the bass, we’ve decided against this as the ‘travel-weary’ look has been a bit overdone of late. (The clips on this page show one of the early prototype basses …new clips featuring the actual production model, seen at the top of the page, will be posted soon.) Fake wear and ‘relic’-ing of an instrument doesn’t really convince anyone — the best way to make a guitar look used, is simply to use it. And this is a bass you’ll certainly want to use. The best thing I can say is that I no longer miss my old bass when pick up the Profile Bass to play. The neck width at the nut falls exactly between the classic P-bass and J-bass widths which, rather than being a compromise, actually offers the best of both. The neck is sealed in a ‘barely-there’ satin finish which protects the wood but doesn’t affect the feel of the neck or make the hands ‘stick’ on the gloss. But it’s the sheer playability of the neck — the perfect depth of the neck from front to back, giving the ideal action and string tension — that’s the stand-out feature of the Profile Bass. And we can confidently say that this will apply to every guitar that’s made, because of the consistency of quality the manufacturer is providing for us. We have confirmed this by not simply having single sample basses made, but by comparing the quality across a whole batch of instruments. I happily took one of these at random for my own bass. In some of the video clips on this page, I’ve kept the amp at low volume so you can also hear the bass acoustically, and how it allows you to put expression into your playing. We spent a lot of time getting the string action right, to create a real player’s instrument. We’ve been able to use a lighter weight wood for the body that doesn’t sacrifice any of the intrinsic sound quality in any way. A good test of a bass guitar is how it sounds acoustically — if it’s got that solid twang when it’s not plugged in (which it does) then it usually sounds even better when it is. The natural warm punchy mid-range tone of the bass is brought out by the pick-ups that have been custom rewound according to the modifications I made to my original bass. 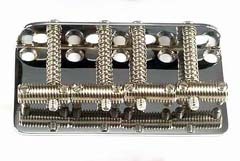 I’ve specified an older-style, slotted-screw bridge because, unlike the string saddles on later bridges, it allows you to vary the string spacing for right hand playing — I personally prefer the strings set at 20mm apart, rather than the standard 19mm. In the past I used to ‘heavy string’ my bass with thicker gauge strings, but no longer feel the need to do that as the Profile offers as-near-perfect a playing feel as I’ve ever found. This screw-thread style bridge has been fitted at my wish. At one of our regular meetings Barry suggested using a modern high-tech bridge to give more sustain. ‘But I don’t want more sustain!’ I exclaimed. Firstly, I think the natural decay of the note is a more authentic voice for this bass. And secondly, the neck and body build is such that it already offers better sustain than any conventional P-bass — in particular there are none of the ‘dead spots’ you usually find on the first string around the 5th to the 7th fret. But while using a classic bridge, I’ve not specified retro-style, riveted, long-spindle tuners as their greater mass unbalances the bass. Of course, you may disagree with some of my reasoning and want to tweak your bass in some way or another, which I hope you do. But I’m more than happy and confident that all of the essential ingredients of a truly great bass guitar are firmly in place.